This is a set of two differentiated versions of one vocabulary practice page. They contain the same content but the modified version has the content chunked into sections. Each version has its own key. 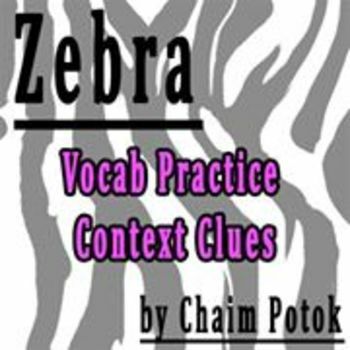 This vocabulary practice will have your students using context clues to fill in the blanks of sentences with the following words from the short story "Zebra" by Chaim Potok: tensing, menacing, disciplinarian, encrusted, jauntily, exuberantly, gaunt, wince, intricate, and poised. Definitions are included at the top of the page for easy reference for your students. 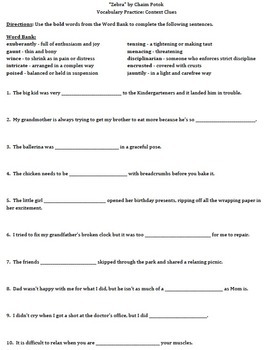 Ten sentences. Each word used once.